Whatever criticisms may be urged against child preachers, of this there can be no question – that God has used them in a wonderful manner. The latest and probably the greatest of such child preachers, that is, judged by the result of her ministry, is Frances Bradley Storr. She is the now famous thirteen-year –old girl preacher of Doncaster, and no one who has heard her can have the slightest doubt as to her conversion and the remarkable spiritual gifts she possesses. Her life-story has been, of course, brief, yet there are in the thirteen years of the sweet-faced Yorkshire lassie many interesting events worth recording. Frances is the daughter of Mrs Storr, the well-known Police Court Missionary of Doncaster, who has herself been a local preacher in Yorkshire Primitive Methodism for many years. It is important to remember this, as it shows where the girl preacher got her preaching gifts from, and explains her early spiritual-mindedness. Frances has but little recollection of her father, for he died when she was a small child. One fact stands out clear in her memory – how her father used to take her and a younger sister to chapel, and seat them one on each side of him. Likewise she has a clear recollection of her father’s death, how he called the weeping children around his bed and kissed them all, and said he was going home to Heaven and would look forward to meeting them all again. Her conversion took place a few years ago. Certain remarks of her Sunday school teacher sank deep in her heart, and that night as she knelt down to pray she experienced that great change known as conversion. The next day she told all her school chums about the Saviour she had found. At first they jeered, but soon the influence of Frances won them all for Christ. Now, ever since her change of life, Frances had wished to go and tell others of her new-found Redeemer. Her mother was a preacher and what more natural that that her daughter should follow in her footsteps? Her mother, convinced of the reality of her conversion, gladly consented, and little Frances began to accompany her parent on her preaching visits, at first only giving out hymns and reading the lessons. But gradually she began to take a more important part – leading in prayer and speaking from the pulpit. In a very short time the fame of the little pulpit prodigy spread far and wide. Great crowds flocked to hear her and her converts grew in number every week. Presently the fame of the Yorkshire lass reached the ears of the London editors, and many of the papers sent representatives specially to hear her. 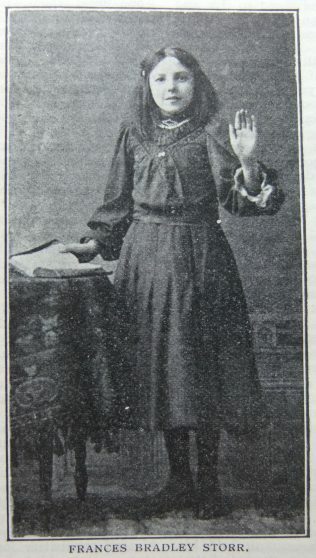 Though she has been regularly preaching for over a year, and thousands have had the opportunity of hearing her message, there has been practically no adverse criticism; every one agrees that she is earnest, has a direct message from God, and is a happy, unaffected, unspoiled girl, whose sole aim in life is to make known the saving knowledge of the riches in Christ Jesus. It may be added here, that up till this visit to Scotland, Miss Storr had only preached in the towns and villages around Doncaster. Then came a great month’s mission in London, the most ambitious effort that the young preacher has yet made. It is true that Londoners are hard to move in religious matters, but the girl preacher dispersed indifference and apathy, and even criticism, by her simple but effective preaching. A word or two about the girl and her method of preaching may now be given. Frances Storr is a typical English girl, frank, open and without the slightest trace of self-conscientiousness. 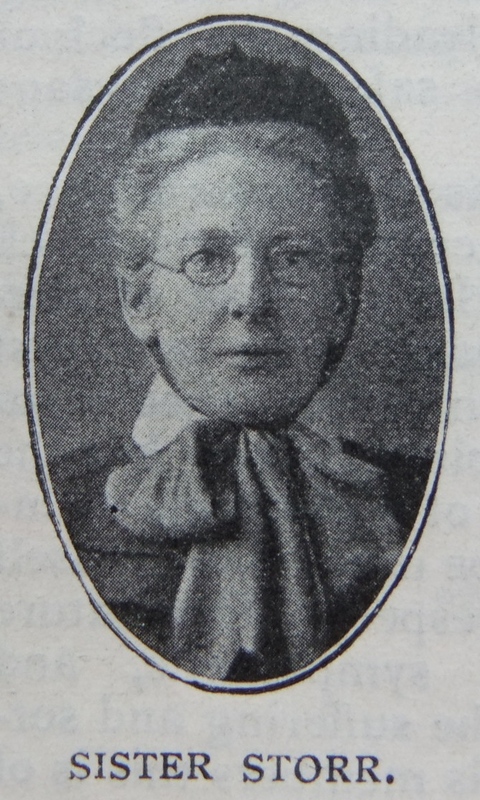 Most people would suppose that her success as a preacher had turned her head – not a bit of it; she is far from being priggish or conceited, rarely looking at the papers which give accounts of her meetings. Her whole soul is in the work to which she has turned her hand. She believes in the sunny Gospel, and it would be difficult to find a merrier or more sunny-hearted lassie in all England. She can laugh, indulges in all children’s games, is fond of her bicycle – in short, Frances Storr is a perfectly natural child. What differentiates her from other girls is the depth of her spirituality. Once in the pulpit she is quickly at ease. Usually she gives out the opening hymn and engages in extempore prayer. Her mother, who accompanies her, reads some passages of Scripture, and expounds them in her own helpful manner. Frances gives out the text in a clear ringing voice, which can be easily heard in any hall or chapel. A slight Yorkshire burr adds a little interest to its tones, and, of course, it is a child’s voice, sweet and winning in its appeal. Little or know gesture is used, except an occasional raising of the arm. The sermons themselves do not reveal any great depth of thought, but the child has the right grip of eternal things. She uses plenty of illustrations, chiefly gathered from her own experience, and it is characteristic that any occurrence or anecdote which deeply moves her is made the subject of an excellent illustration. Every service is followed by an after-meeting at which results are secured, the girl-preacher herself, as well as other workers, making personal appeals to men, women, and children to come forward and accept the Saviour. A large number of children have been influenced for good in this way. Frances was born on 14 October 1893 at Adwick, Yorkshire, to parents Henry Bradley and Frances Marris. Frances, senior, married Robert Woodhall Storr in 1900. Frances emigrated to Canada in 1911 with her mother where she married Frank Charles Draper, a farmer. She died in 1970 at Yorkton, Saskatchewan, Canada. The 1911 census also describes her sister, Rose, as an evangelist. Frances Storr and her sisters were popular and sought after in the then Epworth Primitive Methodist Circuit, adjacent to Doncaster. Her sister Rose Bradley Storr was also a girl preacher appearing with Florrie Elkins (the girl singer) particularly in the Doncaster area, with the family locally referred to as The Four Evangelists. The Epworth Bells reported in 1908 of the visit of Miss Rose Bradley Storr accompanied by her singing companion Miss Florrie Elkins, both then aged 15, at the Westwoodside United Methodist Church. It reported that so popular were the services that on the Sunday evening The two continued to the Epworth Kilham Methodoist church and forms had to be placed down the aisles to cope with the numbers attracted to the services.